Hey Francisco! 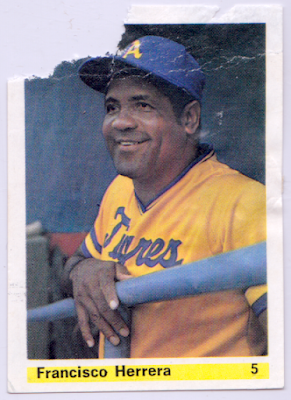 That's the smiling mug (and missing corner) of longtime baseball player, manager, and coach, Francisco Herrera. He lost a chunk of paper to the owner's yen to glue him somewhere, but doesn't look broken up about it. Pasting baseball players into albums was commonplace for those fans and that era. This colorful #5 shows Herrera as an 80s coach in Venezuela for Tigres de Aragua, but Francisco first appeared in my type collection 20 years earlier as Phillie slugger Frank Herrera. 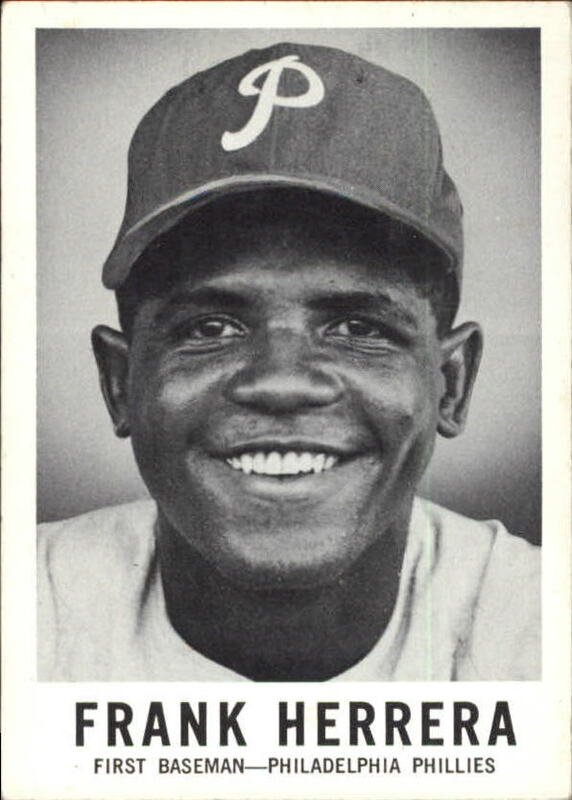 His SABR-written bio makes for fun reading; I'll link it at the end of this post. 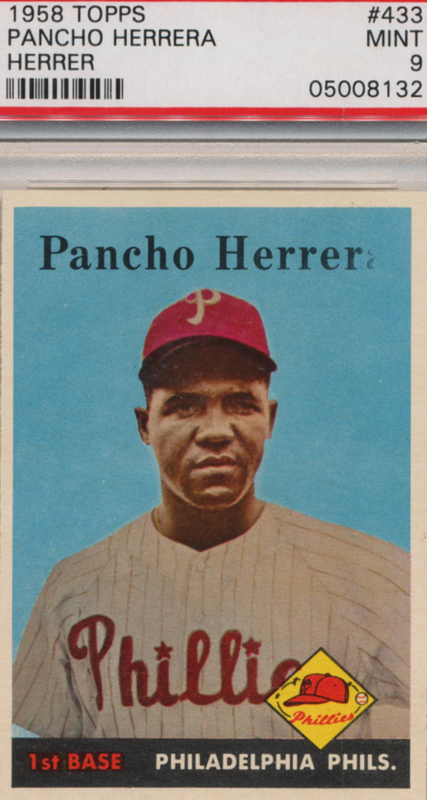 Jump back in card history a little earlier and Francisco's the rare Topps error "Pancho Herrer." Some dismiss this one as just a printing ink goof, but many agree the error's significant. "Herrera" versions price as commons; this PSA 9 "Herrer" sold for $18K. The 1980-81 winter league sticker set numbers to 288, organized by team for easier pasting into the aforementioned album. 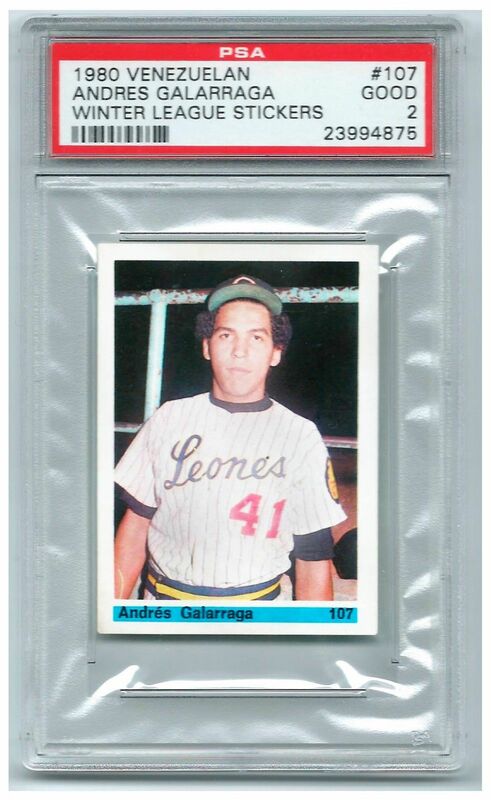 I couldn't put my hands on an actual album scan, so here's another of its jewels: an extremely youthful Andres Galarraga on one of his first card-like pieces of paper. Andres successfully battled lymphoma twice during his career, winning the NL Comeback Player of the Year after each return and becoming the first to repeat such a feat. As promised, here's the SABR bio for Juan Francisco Herrera Villavicencio! Don't forget his Leaf card, because it'll come up again when I cover Topps competition and innovations in the early 1960s. Value: The 1980-81 Herrera sticker set me back $11 on eBay. Few dealers stock Venezuelan Winter League sets, so I paid more than expected due to a lack of alternatives. Thanks to Clyde's Stale Cards for helping ID this set, as it doesn't appear in many guides. Fakes / reprints: "Cheap to make" means "cheap to copy," but I think only stars would be at risk for counterfeiting a recent oddball set. 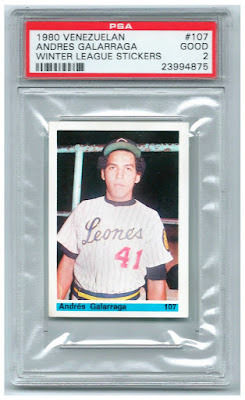 Galarraga might be faked. Herrera, probably not.